Welcome to Jester’s Billiards, the best sports bar for sports in Gilbert, Mesa and Phoenix – billiards, darts, and craft beers! The start date for the new Sunday 9-Ball league has been changed to Sunday, April 28th (instead of April 21st.) Sign Up Now! Want to learn to play better billiards? Well, If you missed the Anthony Beeler video series, you can find all of the lessons from Mr. Beeler right here! Our Beer List is UPDATED! Check it out!! Get-A-Cue League Standings and Schedules! See the Darts League standings here! Come on down and support YOUR community! Ask your bartender for details! Beer list is courtesy of Taphunter.com. Visit us on Taphunter and download the app. …and remember to ask your server about our new Burgers menu! If you need to call out of a league, use our form! Info on the GET-A-CUE LEAGUES is right here! The GET-A-CUE LEAGUES GUIDELINES and RULES! 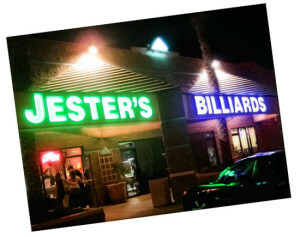 WEAR YOUR LOGO “JESTER’S BILLIARDS” SHIRT OR HAT… YOU GET FREE POOL! In order to have the entire table free, everyone playing must have a Jester’s Billiards shirt or hat. Download the flyer from here! GET YOUR HAT AND T-SHIRT AT OUR ONLINE STORE!!! Start saving at our Online Store now! CHECK OUT OUR CURRENT SPECIALS! Watch our Live Video Stream!! 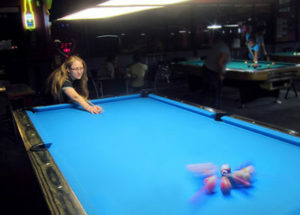 Live Video Streaming on Jester’s Billiards web site. 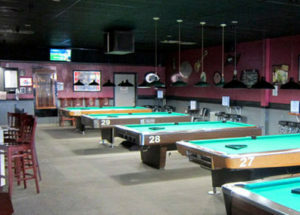 The Blog @ Jesters Billiards!! NEW VIDEO post on our blog!! Don’t think you can just “get lucky” at One-Pocket! Here are some Winning Tips for One-Pocket! It’s Jester’s Billiards for billiards, darts, craft beers! Check out our Specials page for our daily drink specials and click on the Current Beerlist link for a PDF of our current beers on draft, and in bottles and cans. Jester’s maintains a selection of beers and wine ranging from the “cheap” to the “exotic.” We have 20 beers on tap! We are PROUD of our beer selection! Come in for a PBR, and stay for the billiards darts and craft beers. 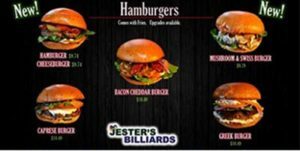 Jester’s Billiards – Billiards darts craft beers!!! Also, check out our Specials page for our “CHEAP BEER NIGHT” on Thursdays. Why take the smoke break in the heat, when you can relax, and play, in our indoor air-conditioned smoking area, complete with pool tables, dart boards, and HD television? What other pool hall or bar can offer that? Note: our smoking room is for 21 and over only. Should you need a great snack, or full meal, we have proudly partnered with Rino D’s Pizza & Wings, located right next door. Thanks for your interest in Jester’s Billiards- billiards darts and craft beers!! Interested in working at Jester’s Billiards? Just download and fill out the Jester’s Billiards Employee Application! Then just bring it in and talk to one of our staff – it’s that easy! You can also email a resume to jestersbilliards@gmail.com. Jester’s Billiards is a fun place to work. Our turnover is not high and our employees stick around a while. It may take us a little while to get back in touch with you, but don’t let that worry you. We’re always looking for good people. Please use our Contact form if you have any questions or comments.